In the mid-1980s, citizens of Rancho California (a name chosen by land developers) formed an Incorporation Committee headed by A-Z Magnetics President, Les Adam. Residents and businesses wanted to find a way to have a greater say in the way they were governed. They wanted local control. It was too difficult working with Riverside County officials who were far away and spread too thin. They wanted faster police and fire response times, more parks, and better traffic circulation. 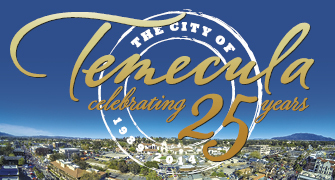 As the city of Temecula prepares to celebrate its silver anniversary on Dec. 1, here is a look at some statistics from 1989 and today. Whether you enjoy dance, musicals or concerts, Temecula’s Stage has something for everyone. The Old Town Temecula Community Theater, which just celebrated its ninth anniversary, prides itself on bringing world-class, family-friendly and affordable performing arts to Temecula. As the perfect encore to a day full of shopping and dining in Old Town, the theater helps you spend the holidays in the best possible way, by making memories with family and friends. Welcoming more than 2 million visitors each year, casual, picturesque, Temecula Valley Southern California Wine Country is a year-round getaway and vacation destination situated within Southwest Riverside County. Temecula Valley is 60 minutes from San Diego, Orange County and Palm Springs; 90 minutes from Los Angeles and Hollywood. Each visit to this genuinely inviting, boutique destination promises a wide variety of things to experience, enhanced by the sunny, relaxed spirit synonymous with Southern California. The Temecula Valley Entrepreneurs Exchange (TVE2), the city’s technology incubator and business resources center, is excited to welcome the Temecula Higher Education Center (THE Center) as the newest addition to the facility, at 43200 Business Park Drive. Earlier this year, a third-party survey research firm conducted a residents survey on behalf of the city of Temecula. The city proactively reaches out to residents in this way every two years to ensure it keeps current on understanding the community’s satisfaction, priorities and concerns regarding the services that the city provides. When it comes to developing visionary programs that meet both an educational need and local workforce demand, California State University San Marcos at Temecula exceeds expectations. “People who come to us want to know that their education or training will translate into a new job, new opportunity or skill set that has clear market value. The programs we are creating deliver on every count,” said Associate Dean Suzanne Lingold. In 2013, manufacturers nationwide contributed $2.08 trillion to the economy; this was 12.5 percent of GDP. According to the National Association of Manufacturers, for every $1 spent in manufacturing, an additional $1.32 is added to the economy, the highest multiplier effect of any economic sector. The city of Temecula is nearing completion of the design and construction plans for the Interstate 15/state Route 79 South Ultimate Interchange project. The project will modify the city’s most southerly interchange where Temecula Parkway (SR-79 South) intersects with I-15, building upon improvements constructed by the county of Riverside some 15 years ago. Just one year ago, Temecula Valley Hospital opened its doors to the community as Temecula’s first acute care hospital. In the past year, the hospital has cared for 26,000 emergency patients and 3,300 patient admissions. Physicians have performed more than 1,600 surgeries, including nearly 300 cardiac procedures.